Not wanting to be on the menu Astrid quickly launched a attack against the closest goblin. If she wins she will take the left right door. Astrid thrust her spear at the first goblin (skill 3 + dice 6 = 9). The goblin screamed in agony as the spear pierced it's skin (skill 4 + dice 4 = 8. Goblin #1 takes 1 damage). The second goblin retalitated, striking Astrid with it's jagged blade (skill 4 + dice 4 = 8. Astrid skill 3 + dice 2 = 5. Astrid takes 3 damage). Seeing their advantage, the third goblin also struck out at the wounded valkyrie (skill 4 + dice 2 = 6. Astrid skill 3 + dice 1 = 4. Astrid takes 2 damage). Seeing that the goblins would be difficult to outsmart, the female warrior realised she would have to use her superior strength. She aimed her spear again at the first goblin, and pierced him with a mighty blow (strength 5 + dice 6 = 11. Goblin strength 2 + dice 1 = 3. Goblin takes 8 damage... dead). The goblin fell down dead and the other two backed off. She knew if she could kill one more that the third would flee. The second goblin, enraged by the death of the first, jumped at the valkyrie, but Astrid easily blocked the attack (strength 2 + dice 2 = 4). Astrid again rammed her spear through the creatures shoulder and it screamed in agony (Astrid strength 5 + dice 5 = 10. Goblin takes 6 damage...). The third goblin also launched a futile attack (strength 2 + dice 3 = 5) with Astrid stabbing him in his leg (Astrid strength 5 + dice 4 = 9. Goblin takes 4 damage...). Both heavily wounded, the goblins began to circle the female warrior who was also bleeding, seeking to find a weak spot where they could attack her. One began to mutter something in their language and then threw what seemed to be a shimmering powder at the valkyrie (magic 1 + dice 3 = 4). Astrid merely scoffed at their feeble attempts at magic, and spiralling her spear in the air then swung the hilt at the second goblin. She hit him clean in the head (magic 4 + dice 4 = 8. Goblin takes 4 damage...) and he fell to the floor dead. Seeing his two associates dead on the cold stone floor, the third goblin dropped his sword and scarpered out of the chamber into the darkness. Astrid had won again, but at what cost? She was hurting and weak. Astrid takes 5 damage but gains 1 luck for a successful battle. I'm not sure what door you want to use next?? Yorick, please submit your points in the forum using a short story and MOC if possible. Deadline, wednesday/thursday. The imp clawed at Fa'ya'yo's face (skill 3 + 4 = 7) with the young faun attempting to swat him away with his hands (skill 0 + dice 5 = 5. F'y'y loses 2 health). The imp disappeared an rematerialised behind the faun, biting into his leg (magic 2 + dice 2 = 4). Fa'ya'yo screamed in pain (magic 0 + dice 3 = 3. F'y'y loses 1 health). The young warrior struck out at the imp with his spare hoof (strength 0 + dice 4 = 4) and kicked the imp (strength 1 + dice 2 = 3. Imp loses 1 health). The imp scuttled away, smarting from the faun's cloven kick, then leaped again at Fa'ya'yo's face, the two of them grappling with one another (imp skill 3 + 3 = 6. faun strength 0 + dice 6 = 6. Evens...). Yorick submitted no stats in time and Fa'ya'yo takes 10 damage and loses 1 luck for an unsuccessful combat. He must know chose another door. Drinlarr kept one eye open as he rested, his hand on his warhammer, ready to spring into action should any foul creature dare to disturb his momentary peace, if you could call anything in this wicked lair, "peaceful." After a brief pause to regain his strength, he arose and scanned the room, evaluating his options. His somewhat simple mind told him that he was making headway toward the center, so there seemed no reason to deviate from his current heading. With renewed resolve, he slung the mighty hammer over his shoulder, and thundered off straight ahead through the center door. Elias sense the beast and decided to act quickly. With the slight movement of his right hand he conjured up a fire blast and proceeded to light the beast on fire. As he started to move quickly to engage his foe, he thought to himself "I feel as thought I'm getting to old for this". and with that he hurled a fireball at the beast. Malekk, still wounded and grimacing in pain, stumbled into the room. Thankful there were no creatures to deal with, he noticed several black mushrooms in the dank corner. Crouching to examine them, the serpentine appendage twisted near and sniffed them. Malekk quickly grabbed them and stuffed them in his mouth, the hearty but flavorless meal giving him much needed strength. He rose from the "meal" and continued straight. Elias sensed the beast and decided to act quickly. With the slight movement of his right hand he conjured up a fire blast and proceeded to light the beast on fire. As he started to move quickly to engage his foe, he thought to himself "I feel as thought I'm getting to old for this". and with that he hurled a fireball at the beast. The wizened wizard sent a fire blast at the vilderbeast (magic 6 + dice 1... = 7) but he had underestimated the creatures power and the fire ricocheted off its skin (magic 4 + dice 6... = 10. Elias loses 3 health...). The powerful beast gnashed his teeth and clawed at the wizard (strength 4 + dice 4 = 8). Elias tried to put up a defence (strength 2 + dice 3 = 5...) but the vilderbeast was too strong (Elias loses 3 health...). The wizard's health was dangerously depleted (4 health remaining...) so he resorted to skill AND A LITTLE BIT OF LUCK. Another flick of his wrist and he ducked under the beast's lashing tail and struck out with his staff but it seemed to take no effect (Elias skill 2 + dice 4 = 6. Vilderbeast skill 2 + dice 4 = 6. This combat was re-rolled using 'luck' after a potentially fatal roll for Elias!). Elias summoned up another spell, an bolts of lightning shot out from his staff (magic 6 + dice 6 = 12), the vilderbeast screamed in pain (magic 4 + dice 2 = 6. Vilderbeast loses 6 health!). The creature flicked his venomous tail at the wizard and Elias dived out of the way WITH A BIT OF LUCK, the tail lashing him on his back (Viderbeast strength 4 + dice 4 = 8. Elias strength 2 + dice 4 = 6. Elias loses 2 health... This combat was re-rolled using 'luck' after a potentially fatal roll for Elias!). The wizard spun his staff and again attempted to skillfully duck under the beast's lashing tail and strike it with his staff (skill 2 + dice 4 = 6) but the Vilderbeast was not caught out and avoided the attack (skill 2 + dice 4 = 6. Evens). Elias summoned another spell, the strain of the battle taking it's toll (magic 6 + dice 2 = 8) but his magic was weakening and the vilderbeast seemed unharmed (magic 4 + dice 4 = 8). With one final swing, the weary weakened wizened wizard struck the beast with his staff (strength 2 + dice 3 = 5...) but the cavern-dwelling carnivorous creature bared his teeth and lunged at Elias (strength 4 + dice 4 = 8... Elias loses 3 health... are you keeping count?). The vilderbeast's teeth sunk into the wizards flesh, the poisoned points plunging into his puny person. As his life slowly ebbed away he cursed the infernal labryinth that would now be his tomb... (Elias is dead). Round 5 - Who holds the key? Drinlarr the stout barbarian had felt he was making good headway. The battles so far had not tested him too much, and though his strength was depleted from lack of filling his large appetite, his overall health was good. After a brief pause in his current room, he he slung the mighty hammer over his shoulder, and thundered off straight ahead through the center door. WHAM! The barbarian fell to the floor, quickly leaping to his feet to defend himself from attack, only to discover that his attacker had in fact been a door. Drinlarr pushed the door, then tried the handle. It appeared to be stuck fast. He tried the handle again and this time heaved into the timber frame with his broad shoulders. It didn't budge. "Humpf!" he said, taking a step back to look at the door. The wood looked old, but in good condition, and lacked the rust and cobwebs that a long forgotten or bricked up doorway might have. The barbarian came to the conclusion that it must in fact be locked. Then something else caught his eye, a skeleton of some long-forgotten warrior was slumped in a corner of the room, but it was the scrap of paper in it's hand that drew Drinlarr's attention. The barbarian reached out with his meaty mitts and pulled the paper from the deceased's digits. It was indeed a map. 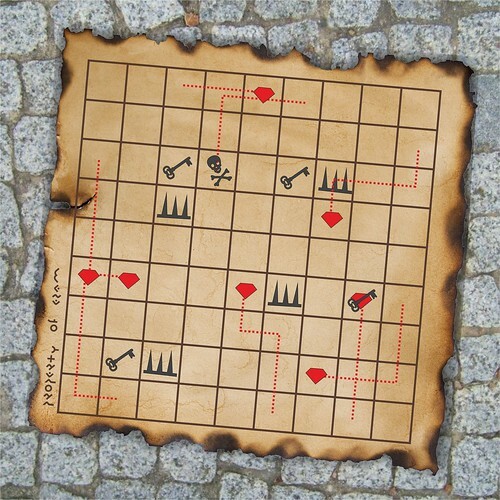 The diamonds on the map moved across the magical paper as if tracing a path, then one flickered and disappeared, replaced by a skull and cross bones... "Well, this is quite irregular" the barbarian mused "but if it's a key I need, then a key I must find!". 3 key symbols on the map were stationary, with the fourth symbol moving in tandem with one of the diamonds "hmmm, but which to find?..." Drinlarr pondered. He rolled the map up, stuffing it in his belt and set of on his new path. Drinlarr finds a map. Ak choose your next path, and submit a MOC if you wish. Deadline Aug 24th (week Wednesday). Elsewhere in the labryinth The Doctor, who was hoping for a better run of luck than the maze had handed him so far, entered another almost identical chamber. There were another four doors, one straight ahead, one to his left, another to his right, and the one behind him that he had just passed through. He felt as if he was making good headway, it seemed a step in the right direction. He adjusted the grip on his wand, something was not right. He felt uneasy, and an unsettling breeze blew through the chamber. Blocking his path, in the centre of the room, was what looked like a pile of rubble. Stones that had perhaps fallen in from the ceiling. He looked up, but the chamber's ceiling seemed intact. Strange, he thought. A slow rumble began to reverberate around the room. An earthquake? The pile of rocks, shuddered and moved, taking a new shape and form until they rose to become a large humanoid shape. It was a stone golem. LilCurt, submit your points in the forum using a short story and submit a MOC if you wish. Deadline Aug 24th (week Wednesday). Not so far way a badly wounded valkyrie stumbled seemingly blindly through the door on her left. Astrid had won again, defeating two goblins and causing the third to flee in fear, but at what cost? She was hurting and weak. The room was empty, with the usual four doors, one on each wall. Astrid began to shiver from her wounds and desperately needed to rest. She saw an old cloak or rug lying on the floor and threw it round her, but then screamed and threw it off. It had felt like a sharp shock, a feeling of static or the spark from a fire. She inspected the cloack again, lifting it this time with the tip of her spear. She gasped as the spear and indeed the cloak seemed to disappear not just from her sight, but existence itself. She placed her shield on the floor and threw the cloak over it, and indeed the shield also disappeared from view, the cloak also taking on the appearance of the cobbles on which it lay. She had indeed found an invisibility cloak, woven from elven cloth it gave it's wearer the ability to disappear. She had heard of such magic but dismissed them as myth, but here she held such an item in her hand. Astrid finds an invisibility cloak. She may use it when she wishes for 2 magic and 1 health. If you don't have enough magic it will cost you 3 health. Fenrir, submit your next path decision in the forum using a short story and submit a MOC if you wish. Deadline Aug 24th (week Wednesday). Yorick the faun had narrowly escaped the claws of a viscious imp by fleeing from the room and locking the door behind him so was now in his orginal room. He decided to go left as it seemed like the only choice available. He entered yet another room with four walls, four doors... and not much else. Though being a druid he did recognise a strange plant growing in one corner of the room. "Dwarf's beard! How fortunate!" the young faun exclaimed as he plucked the fuzzy looking weed and munched on a leaf, stuffing the rest in his satchel. Yorick gains 1 magic point. Yorick, please submit your next path decision in the forum using a short story and submit a MOC if you wish. Deadline Aug 24th (week Wednesday). He entered another room identical to the last, with four walls and a door on each wall, and nothing much else to apart from a recently slain goblin. It appeared to have been cleaved in two by a blow from a possibly a large war hammer. Malekk knew a barbarian must not be far away. Drakk, please submit your next path decision in the forum using a short story and submit a MOC if you wish. Deadline Aug 24th (week Wednesday). Mau slipped off to his right, knowing that he was potentially following in another warriors footsteps... and as he entered the next chamber he discovered just that. Rulf the Orange had just defeated a stone golem and was headed for the door straight ahead when he felt another enemy slip into the room. He spun quickly around but all he saw was shadows. He eye sight might have failed him but his instinct told him that something lurked in the darkness. Mau stayed hidden in the shadows observing the other warrior. Rulf tightened the grip on his sword, preparing for the hidden foe to attack, he may not have been able to see him, but he could hear his breath. Josdu and Fritzix, you may submit a MOC and short story in the forum but please MESSSAGE ME YOUR POINTS SUBMISSIONS. You can use as many points as you like, but remember to save some for future battles. We will do one round of stats, the winner taking the losers gold and getting a 'free move' onwards. The loser will have to wait for the next round to move, but cannot follow the winner. The person with the highest individual stat submission will go first. Once you've done this I'll crunch the numbers and write up the result, then move on to round 6! Deadline - Aug 24th (week Wednesday). Fa'ya'yo Couldn't decide where to go next. He never liked goblins, and that last one scared him half to death! "Well, lets avoid more of em' little goblins. Left? Hmmmn...Right? Straight?" He spun in a few circles, and suddenly stopped. His wavering hand was pointing left. She will take the door to her right. Drinlarr was perplexed. How on earth was he supposed to figure this puzzle out? His preference was to win with his muscles, not with his mind. This was going to be a real challenge. With the door ahead locked fast by some infernal magic that rendered his blows useless, he determined to find a key. He figured that taking a right would be the best option, so he carefully make his way through the unlocked door in that direction. Malekk knelt down to study the goblin's corpse. His "companion" darted back and forth with anticipation, sensing the recently slain greenskin. With a wince of pain, the warlock rose and continued for door straight ahead. The doctor steps through the door and looks ahead of him to see a giant stone golem awaiting his entry. This confounding maze has already taken its toll on him. Low on health and without his companion by his side as a voice of reason. And very frustrated, an seemingly upset Doctor, raised his sonic screwdriver and screamed "I have no time for this I really must be going!" And with that a blast of energy emits from the tip of the screwdriver.